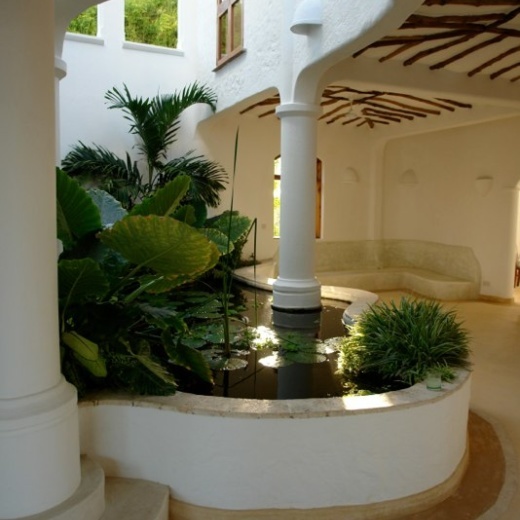 A luxurious living set in 2 acres garden of an indigenous forest along the Indian Ocean. It is situated on a low coral cliff of Takaungu creek and the Indian ocean. Low tide reveals acres of sand, studded with tide pools - each an aquarium in miniature. As the tide turns, the creek is transformed into turquoise shallows, on which fishing dhows sail home. The plantation is a great place to walk, especially in the cool of the morning or in the late afternoon. The groves of baobabs and figs that lie to the north around the mouth of the creek are good for bird-watching and a species of monkeys as well as duikers, fruit-bats etc oftenly seen when the trees are in fruit. The quiet tracks around the plantation are ideal for jogging and all link up, so eventually you will come back to somewhere you recognize. 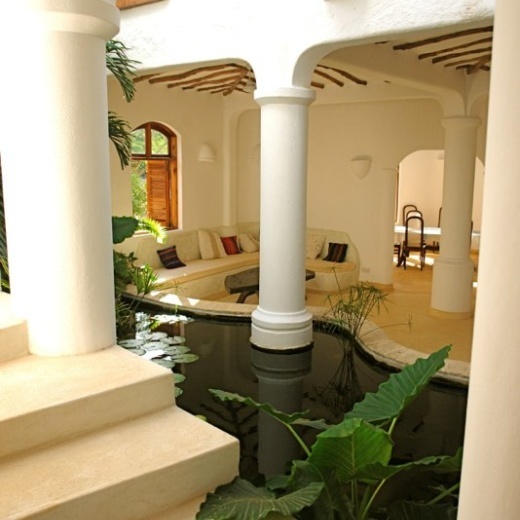 The house is spacious and hand crafted from coral and dhow-wood - suited to idle days and moon-lit nights. It is large and spacious with four bedrooms and easily sleeps 10. Under special circumstances it may be possible to sleep more. It is ideally suited to family groups. Depending on the time of year and availability, it is possible to either take the whole house or to take individual rooms. The house is mainly self-catering, you may take the house fully-catered or bring your own food. The house has an excellent cook who will prepare and cook anything you bring, or you may prefer to shop locally. Seafood can be purchased from local fishermen - prawns, fish, squid, crab, lobster, octopus etc. Basic foodstuffs are available in Kilifi where there is a market and a new supermarket. The nearby farm shop sells chicken, fruit and dairy products. If coming through Mombasa, it is advisable to shop at the Nyali ‘Nakumatt’ on the way as it has a much wider range. The boatyard does reasonable meals, and is the social hub of the fishing / sailing community. 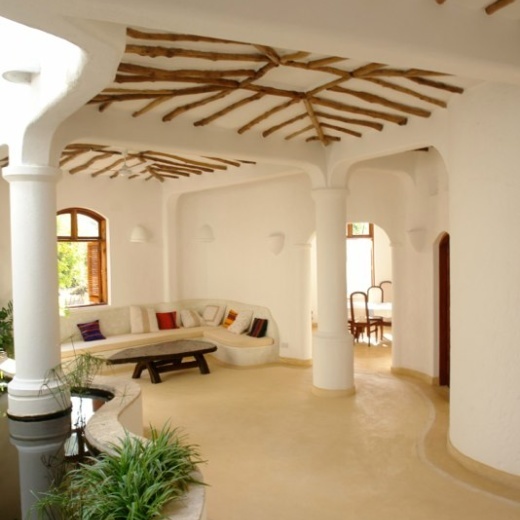 "One of a kind, probably the most original houses on the Kenyan coast." The large house ( c. 20,000 sq ft ) covers three levels with swimming pool, atrium, courtyard, kitchen, family and breakfast rooms on the lower level. A hanging staircase leads from the atrium over a koi pond and waterfall to the next level with its ‘village square’ and four large bedrooms - all en suite. The upper level with its private roof, star-bath, bridge, and sundowner barazza is reached from stairs from the village square or from the master bedroom. The house sleeps 10 (2+1, 2+1, 2, 2) with ease and there are additional star-beds on the roof for those who’d like to star-gaze. The house is fully staffed with a team of five that includes a chef, and full catering is offered as an option. 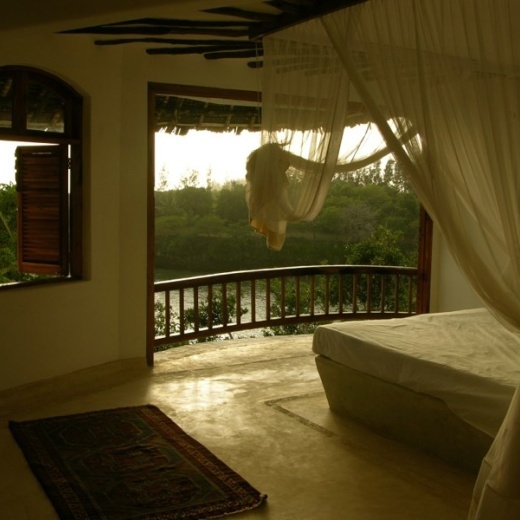 The 4 bedrooms are all large with oversize beds ( the master bed is c. 11’), furnished with persian rugs and swahili furniture. All have fabulous views and large bathrooms. The furnishings are all hand crafted from local wood and fossilised coral. The ceilings are high and even on the warmest evenings, there is always a gentle breeze.